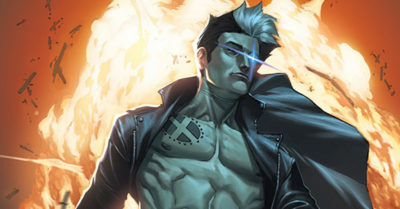 However, there was the question of what to do with Nate Grey. In the Age of Apocalypse he was the most-powerful rebel, but in 616 Marvel he had nothing to rebel against. There was no narrative to welcome Nate Grey to the main Marvel timeline. His counterpart Cable was himself a mysterious figure on the outskirts of X-Men continuity with a nebulous connection to his parents Scott and Jean. X-Man became that, but moreso. At least with Cable writers could lean into his military nature to make him a mutant fixer of sorts. Nate Grey had no such centering narrative device. Writers increasingly leaned into his messianic tendencies, but also his naiveté and lack of allies (except Spider-Man!) leaving him vulnerable. His series was a meandering read then and it remains one today. At the time, I’d spend each month waiting for the big reveal – the plot thread that made bringing Nate back all worthwhile. In retrospect, I know that it never existed and would never come. Despite the impressive name, X-Man became one of the most tertiary X-titles. Nate had no part in the X-Men, save for his brief intersections with “Operation Zero Tolerance” and a later appearance in Astonshing X-Men (no, not the Whedon one, the “X-Men vs. Apocalypse” lead-in). It all culminated with Nate Grey abandoning his physical form to disperse himself into the cells of every living being on Earth in issue #75, to the utter non-reaction of the rest of the world. Of course, that’s an easy death from which a Marvel character can return. It just took a decade to happen, in the pages of Dark X-Men. Nate Grey made a terrific and mysterious loaded gun in the hands of Norman Osborn, but that was quickly defused in the pages of Abnett & Lanning’s New Mutants into just another fish-out-of-water team member. And then, once again, in 2013 Nate Grey disappeared without a trace – though this time his body was presumably still intact. Now, in the final months of 2018, Nate Grey appears to be primed to make his return in the pages of the relaunched Uncanny X-Men, as messianic as ever … to be followed by his own event! Will The Age of X-Man mark a permanent closing parenthesis to Nate’s birth in the Age of Apocalypse? Or, will it be a springboard to place him in the position of power in the Marvel Universe it’s always been implied that he deserves? Tune in to X-Men comics over the next three months to find out! Want access to this guide today? It’s available in exchange for covering $1.99 a month of CK’s hosting expenses. Those “Pledgeonaut” Patrons now have access to 36 exclusive guides – that’s 1.5 guides per dollar of pledging per year at the Pledgeonauts level! Current Exclusives For Pledgeonauts ($1.99+/month): 36 Guides!